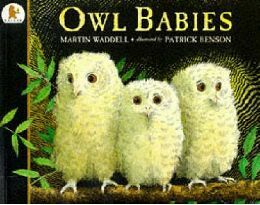 ‘Owl Babies’ is a gorgeous picture book written by Martin Waddell and illustrated by Patrick Benson. Quite simply, it tells the story of three little owl babies – Sarah, Percy and Bill and what happened one night when their mummy disappeared. While all this is going on the looks on their faces are getting more and more worried. Patrick Benson is an excellent illustrator and he really captures that startled nervous look that you see on so many owls! Finally, when the owls have run out of ideas they decide just to sit on their branch, close their eyes, and wish their mummy home! This is accompanied by a beautiful picture of all owl babies with eyes tightly shut. Of course, as this is a book for children, you can expect a happy ending so after lots of wishing their mummy does return. She ‘swoops soft and silently’ through the trees to her little babies who are overjoyed to see her. Once they have calmed down, she asks what all the fuss is about because they should have known that she would come back and they all say that of course they did. I like this simply story for lots of reasons. Firstly the pictures are wonderful and they really add to the storyline. You see those little baby owls looking scared and vulnerable and children can empathise with how they are feeling. It also helps children to talk about their own fears of being left alone and as the ending is a happy one this is reassuring to them. I also like the language used in the book particularly the words used by the little owls. My daughter likes joining in with what they say, especially little Bill’s cries of ‘I want my Mummy!’ It is good fun to practice different voices for each of the owls as you are reading. I also think it’s good the way the sister and brothers look after each other. As I have two girls I can use this book to talk about how they can look after each other too – my older daughter loves to look after her little sister just like Sarah and Percy look after Bill! ‘Owl Babies‘ is published by Walker Books and my copy has an RRP of £4.99. It is good quality paper and has stood up to a lot of page turning in our house! I also know that it is a book used by a lot of schools in KS1 so it is likely that your child might come across it when he or she goes to school. All in all this is another excellent story/picture book. It has a good story line with a happy ending and helps children recognise the importance of caring for others! I love reading it with my daughters as it makes us feel all warm inside! No Comments on "Owl Babies"